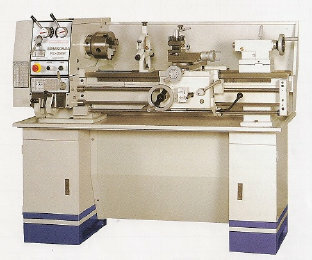 This New 12" Swing Birmingham YCL-1236GH Lathe is an all geared headstock 12" x 36" metal cutting lathe constructed of high tensile strength cast iron and hardened and ground bed ways. A rugged lathe for it's size the Birmingham YCL-1236GH lathe is complimented with Automatic Longitudinal Feed and Automatic Cross Feed . Additional features include a Removable Gap Bed, Splined Shafts in the Headstock, Emergency stop button on the front of the headstock and a Jog Button for easy engagement . An extra safety switch shuts down the machine entirely when inspecting the belt . A built in full size splash guard, 4-Way tool post, thread chasing dial, 3 & 4-Jaw chuck, steady rest, follow rest and floor stand are all standard equipment on the Birmingham YCL-1236GH Lathe . Max swing over carriage 7"
Max swing in gap 17""
Width of bed 7 1/4"